Researchers have always recognised the importance of disseminating the findings of their work, however, recently the need to proactively plan and drive the impact of those findings on the wider society has become a necessity. Firstly, this is because funders require evidence of return from investment and secondly and crucially because national research assessments are becoming powerful determinants of future funding. In research studies associated with nursing, impact needs to be demonstrated by showing the effect on a range of stakeholders including service users, patients, carers, the nursing workforce and commissioners. Engaging these groups is a well-known challenge influenced by lack of access to academic journals, lack of time to read long complex research papers and lack of opportunities to interact directly with the researchers. This needs to be addressed urgently to enable nursing research to increase the impact that it has on health delivery and the work of clinical practitioners. Social media is potentially a novel way of enabling research teams to both communicate about research as studies progress and to disseminate findings and research funders are increasingly using it to publicise information about research programmes and studies they fund. A search of the healthcare literature reveals that advice and guidance on the use of social media for research studies is not well understood or exploited by the research community. This paper, therefore, explores how using social networking platforms, notably Twitter™ offers potential new ways for communicating research findings, accessing diverse and traditionally hard-to-reach audiences, knowledge exchange at an exponential rate, and enabling new means of capturing and demonstrating research impact. 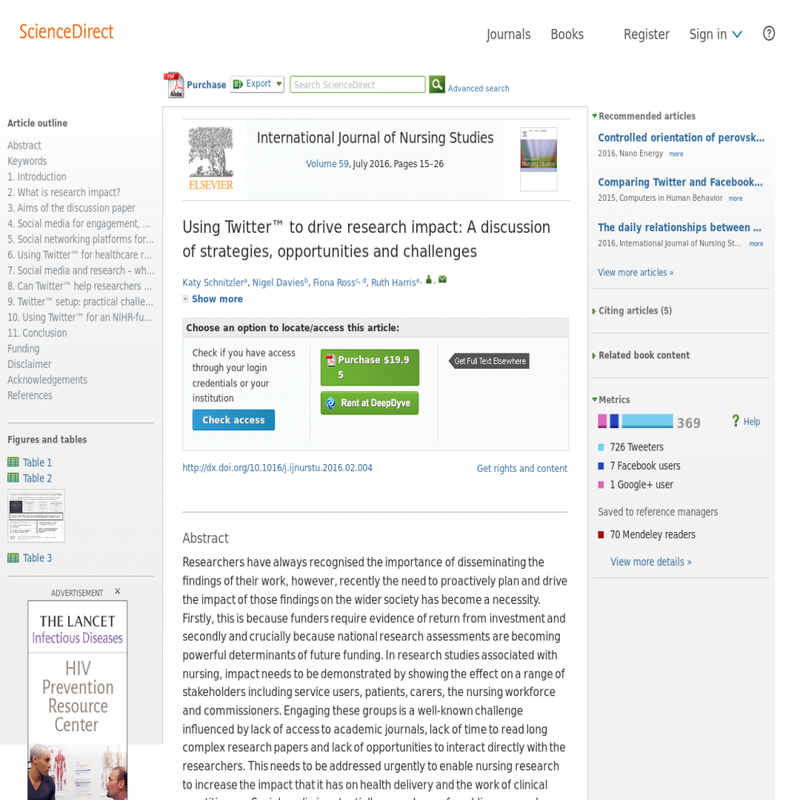 The paper discusses approaches to initiate the setup of social networking platforms in research projects and considers the practical challenges of using Twitter™ in nursing and healthcare research. The discussion is illuminated with examples from our current research. In summary, we suggest that the use of social media micro-blogging platforms is a contemporary, fast, easy and cost effective way to augment existing ways of disseminating research which helps drive impact.